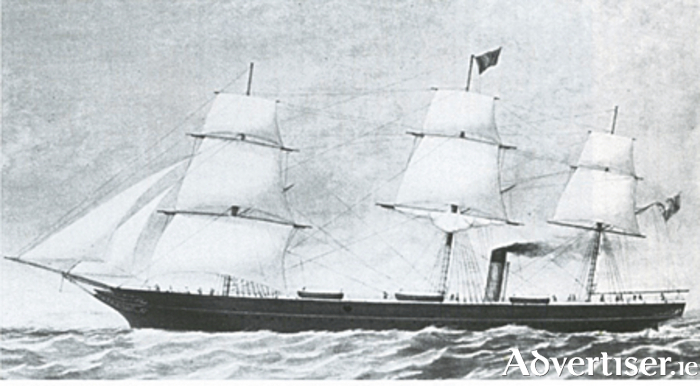 SS Circassian had a successful career with the Galway Line before becoming an unsuccessful Confederate blockade runner. The American Civil War (1861-1865 ) offered rich pickings to qualified seamen and shipowners looking for quick profits. The Union blockade of southern ports was beginning to have an effect on Confederate trade. But any ship which steamed safely through the blockade could command high prices for its cargo. On the homeward journey, if you were lucky, large profits could be made on a cargo of cotton which was in big demand in Britain. When the Civil War broke out on April 12 1861, the newly formed Confederate States had no ships to speak of in its fledging navy. The Confederacy was in dire need of many basic supplies. Without the resources of the industrial north, it had to look to other venues for supplies. Shortly after the outbreak of war, President Lincoln initiated a blockade of southern ports which was initially slow to materialise as the task of patrolling thousands of miles of coastline was enormous. The situation was even more challenging as Britain refused to accept the North’s embargo on ships entering southern ports. She opened her territories in Nassau, Bermuda and the West Indies to facilitate blockade runners. The crisis generated an enormous naval industry which brought great profits for shipbuilders, shippers and suppliers. Ships from Europe would arrive at Bermuda, transfer their cargo to smaller, faster, steam-ships, which in the gathering darkness, would make a dash for one or other of the Confederate ports such as Wilmington, North Carolina, Charleston, South Carolina, Savannah, Georgia, and other ports along the Gulf of Mexico, Mobile, Alabama, New Orleans, Louisiana and Galveston Texas. Many ships, previously known in Irish waters, were sent out by their owners to try their luck, with mixed fortunes, at running the blockade. Our friend John Orrell Lever, founder of the Galway Line, hoped to make a quick buck by taking his chances in getting a cargo into the Confederate ports. He created a new company, Howard-Lever, and charted the Tubal Cain. In the summer of 1862 she crossed the Atlantic to Bermuda, but was captured on her first attempt at running the blockade by the USS Octorora off Charlston. She was subsequently auctioned off at a prize court. Equally unlucky was the SS Circassian. She had made eight round trips between Galway and the US for the Galway Line, before being chartered to Zachariah Pearson who supported the Confederate cause. Again, on her first attempt, she had the misfortune to be outrun and captured by the USS Somerset. As a Union prize the Circassian was commandeered by the US navy for use as a supply ship, delivering stores, ice, replacement crews, and mails to the many ships of the Gulf Blockading Squadron . Despite being a slow supply ship the Circassian probably surprised everyone by capturing a fast steamer, The Minna, off South Carolina. She was on her way from Nassau to Charleston, with a valuable cargo of iron, gunpowder, hardware, and marine engine parts, essential for the construction of a Confederate ironclad, the latest weapon in naval warfare. After the war the Circassian was sold to the Ruger Brothers Line which operated on the New York to Southampton and Bremen route. Later still she was converted to a general cargo vessel and was lost in a fierce gale when it ran onto the shore near the American coast opposite Bridgehampton in the last days of December 1876. She had in fact just picked up the crew of a sinking barque, the Heath Park, in mid-Atlantic. But their joy was short lived as the storm gathered strength, and pushed the Circassian on to rocks. In the drama which followed, the local lifeboat managed to rescue 47 men. Thirty three men desperately struggled to pump out the water. Weather conditions deteriorated to such an extent that no one was able to approach the ship or leave her. Her hull broke in two and only four survivors managed to make it ashore. The Circassian met an unlucky end. But in her varied career it was only during her Galway Line ownership that she operated with any kind of success. The wreck of the Circassian was yet another reminder of the extreme danger, and hardened bravery required in developing a transatlantic serivice in the 19th century. Next Week: Washington grew concerned at Irish support for the Confederacy. A US vice-consulate was established in Galway to keep an eye on things. NOTES: *Many Irish members of the Parliament actively supported the Confederate cause., in spite of having closer business links to the northern states. Sir William Gregory, MP for County Galway, invested $4,000, a very large sum of money at the time, in Confederate bonds, which were worthless by the war’s end. A large number of Irishmen volunteered for the Confederate navy. It is estimated that out of 5,000 sailors, as many as 845 were Irish. I am leaning heavily on Tim’s book Transatlantic Triumph and Heroic Failure - The Galway Line, published by The Collins Press 2002.